Took advantage of the "casual" aspect of casual Friday and wore a maxi dress to the office! This outfit is actually an idea I'd had for a while, but had saved for the third trimester when I knew I'd be finding it difficult picking what to wear to work. I really like the drape on this jacket, and thought it kept the maxi dress from looking too informal. Got a few compliments, and a few "wow your bump is huge!" comments so I consider it a good outfit, haha. Can't believe I've only worn this jacket once before on the blog though - definitely should be wearing it more often! Last worn: black maxi dress, waterfall drape jacket, gold glitter belt, studded Balenciaga sandals, Balenciaga sorbet city. This is what I wore this evening, for a family birthday dinner. I wore a similar outfit during the day, without the belt and with my Louis Vuitton neverfull. We spent the day with my father in law, and test drove another car. In the evening we went out for dinner with family and friends, then had cake and champagne (of course I skipped the champagne!). Was a really nice way to end the day. 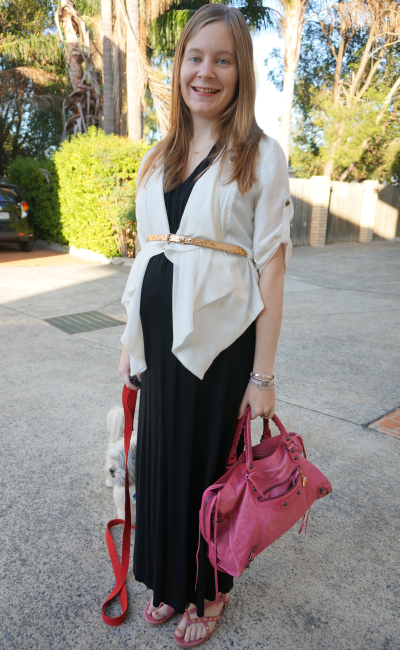 Last worn: Ray-Bans, MEV Havana maxi dress, Kmart black glitter belt, Balenciaga sandals (see above), vintage Chanel flap bag. Linking up with Sunday Style today. Just gorgeous! Love this bright color :) Styling your maxi dress with that jacket is a great idea! You always put together such beautiful outfits Mica. I too love the draping on the vest you are wearing in the first outfit, and the glittery belt is the perfect glamorous touch! Loooove the pink maxi in you as well, such a pretty color! You look stunning, I love your maxi-dresses and your Valentino sandals! Pink Suits you nicely. I am also in my third trimester of my pregnancy and I am loving it. you need to wear that white jacket more often -- the drape is fantastic!! love the little bit of sparkle you added with the skinny belt on your first outfit too! I love the glitter belt add on!! Isn't it funny how people say 'wow...huge bump...' And similar things! :D we take the liberty to say all sorts of funny things to expecting mums. Lol. Love the first outfit. Belts look so good on pregnant women and you are no exception! I realllllllly love the first outfit!! I quite like how the baby bump looks when you wear a maxi dress! Love how the white jacket drapes so flatteringly on you! I love the way you've styled your maxi! Both outfits are great! Good luck finding your new car - that's one type of shopping that I do not enjoy. I find driving quite stressful - test driving a car we haven't bought yet even more so, haha! Love the pink maxi dress on you such a beautiful colour. The glitter belt is so pretty. I can't stop admiring your Chanel bag. My dream is that one day I may own one. Hello Mica, wow you are looking good! The maxi dress is a great choice for this time. The cardi with a gold belt is lovely and like how you wear beautiful bags. Hope you find a new car, shopping for one can be a challenge. U look so much fab and lovely! You are glowing! Love the belted look with maternity wear! That Chanel bag!!!! Loving the maxi dresses on you and the shirt over the top is a great style. I wear that often myself! 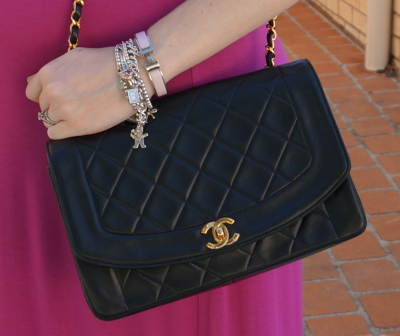 Love the glitter belts and that Chanel bag!! Your casual Friday is soo not a casual Friday outfit in my books. Haha. You look like you could be going to a posh evening event in that maxi and glitter belt + super cute blazer. I have a dress similar in colour to your second outfit, looks lovely on you. How patient your pup is to pose for all these pics. Photogenic pooch much? You look glowing in both maxis! I really like how you belted the drapey jacket...so pretty. Maxi dresses are always a hit. Both look fabulous on you. Love that cardi and how you belted it. The pink maxi ! you look outstanding and beautiful in this dress and of course the bag can only add more glam.